Perhaps as far back as 3,000 years a unique form of astrology began to evolve in the Mesoamerican region of the New World, today's Mexico and northern Central America. A sequence of 20 signs, not of space like our Western zodiac, but of time, evolved and became the core of a great astrological tradition that has been perpetuated up to the present time. The key to this tradition and the framework within which the 20-signs cycle is the 260-day astrological calendar. 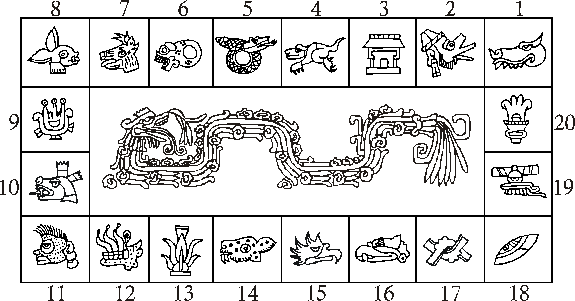 The 260-day astrological calendar, also known as the sacred calendar or divinatory calendar, was used by all the major cultures up to the Aztecs, and is still being used by Maya peoples in the more remote sections of Mexico and Guatemala. It consists of a cycle of 20 days, each having a name and a specific symbolism that cycles 13 times. On a more subtle level is a cycle of 13 that repeats 20 times within this same period. A person's birth is recorded as occurring during one of the 20 signs, the day-sign, and also during a 13-day period or sign. Again, these are signs of time, not of space like the zodiac. According to anthropologists who have studied these peoples and their use of the calendar, it has not dropped a day since the invasion of the Spanish conquistadors and friars. Although the calendar itself survives, the meanings of the key symbols have become somewhat distorted and are in need of rehabilitation. Many people have heard about the Mayan calendar. More properly called the Long Count, this time-keeping tradition is essentially astrological – it was the mundane astrology of ancient Mesoamerica. The Long Count is a 5,125-year period that is one fifth the length of the roughly 25,600-year cycle called the precession of the equinoxes. The ancient Maya divided this period into smaller pieces much like our calendar year is divided into months, weeks and days. The most important division of the Long Count is the 260 katuns, or periods of about 20 years. Each katun functions like a day-sign, except that it is the length of a human generation! Today we are living during the final years of the last katun which will end in 2012. Like the Western zodiac and the Chinese cycle of 12 years, many of the twenty days are named for animals. In early cultures, animals were very much a part of life. Each animal has its own peculiar character and it was convenient to designate a personality by associating it with an animal. We do this today when we call a person a snake, or say they are bull-headed. Countries have official animals also. Of the twenty named-days, ten refer to animals. The other ten refer to forces of nature, plants or life experiences. In Western astrology, one is born under a particular sign, or more properly, the Sun was in a particular sign at birth. Likewise in the Aztec sacred calendar, one is born during a day that is "ruled" by one of the twenty named-days. In ancient times the knowledge of the sacred calendar and the twenty named-days was kept by both priests and calendar specialists who read fortunes and answered questions for the public. In the lands of the Maya these people were, and are, called daykeepers. The Aztec word for the astrological calendar is "tonalpouhalli" and the order of the days was kept in picture-books called "tonalamatl," which means "book of fate." When a child was born, the parents would go to a priest or reader to learn the name of the birthdate. Part of the child's name would be the name of that day. In the manuscripts from Aztec times, persons are often referred to by their calendar name. Eight-Deer, a hero in one ancient picture-manuscript, is a good example. The parents would also learn about the child's fate, character and profession. In order to avoid a bad fate, parents would often have their children baptized on a better day, even if this meant waiting a few days to make the birth official. The sacred calendar was also used to find auspicious times. When merchants were to set off on a long journey, the astrological calendar readers were consulted. The preferred day for a business expedition was the day 1-Serpent. Likewise, the military used the calendar to time their actions. Individuals could consult astrologers to find answers to questions and cures for illness. Like the I-Ching, the great divinatory text from ancient China, the astrological calendar was a guiding force for the people and the culture. Finally, sky events such as eclipses, planetary conjunctions and the movements of the planet Venus were interpreted according to the time-signs that these events occurred within. There are a few tantalizing remnants of delineations for the effects of Venus/Sun conjunctions during the 13-day signs. Anecdotal research suggests that these delineations continue to work in modern times. Here are the twenty signs or symbols that form the core of the Mesoamerican astrological tradition. Like the twelve signs of the zodiac, they follow a definite sequence and symbolize a kind of evolutionary movement. Each of the day-signs is assigned to one of the four directions in the order East, North, West and South. This order repeats five times -- there are five sets of four signs that make up the key twenty signs of the 260-day calendar. We can see an analogy with the 4 elements of Fire, Earth, Air and Water in Western astrology as a classification of each of the 12 signs of the Western zodiac. Signs of the East are powerful and initiating while those of the West are concerned with relationship. This is similar to the directional associations with the horoscope, the Ascendant being East and the Descendant being West. Signs of the North are more mental, those of the South more emotional. The first of the day-signs is called Crocodile. It is a sign of the east and is followed by signs of the north, west and south, in that order. Persons born under it are aggressive, yet protective, energetic, creative and initiating. They have a personal power that must be used creatively or they may become dominating. Both Mao Tse Tung and Walt Disney were born under this sign. The second day-sign is Wind, a sign of intellect and communication. Natives of this sign are usually multifaceted and versatile, but also idealistic and romantic. They frequently struggle with commitment issues. Elizabeth Taylor and Richard Pryor were born under it. Next comes House, which rules rigid structures and traditions. Those born under this sign are deep and introspective, and they also tend to project an imposing presence. They will work long and hard to meet their security needs. Marlene Dietrich and Fidel Castro were born under this sign. Lizard is a sign of performance, sexual maturity and independence. This sign produces individuals who are driven to reach high standards. Self-esteem is important to them and they are often attracted to attention-getting activities. Bill Cosby and Paul Gauguin were born under it. The day-sign Serpent, like the sign Alligator, is a sign of the east and it begins the next set of four signs. It rules power and charisma as well as emotional upheaval. Natives of this sign are intelligent but also extremist in many ways. Born under it were Marilyn Monroe and Warren Beatty. Death, the next day-sign, symbolizes personal sacrifice and acceptance of change. It is a sign of politics and practicality and produces person who work hard for the community to which they belong. George Bush and Jane Fonda were born under it. Deer is a day-sign that is contradictory in many ways. For these natives community and family are of great importance, but so is their freedom to follow their nomadic instincts. Deer types are also very sensual, artistic and even eccentric. Prince Charles and Mozart were born under Deer. Rabbit, a sign of cleverness, games and competition, produces persons with active minds who must always be doing something. They have a great liking for music and humor, but they can also be argumentative and even self-destructive at times. Born under it were Elvis Presley and Jimi Hendrix. Water is the next sign of the east and it represents emotional power and leadership. Persons born under it struggle with powerful emotions and urges. They are great dreamers and are some times psychic. Both George Washington and John Lennon were born under this day-sign. Dog, a sign of loyalty and leadership comes next. Consistency and commitment characterize persons born under it. They are good team players, usually very creative, and strive patiently for authoritative positions. They also have a liking to roam, but not too far from their territory. Mark Twain and Yassar Arafat were born under it. Monkey is the sign of the performer or actor. This sign needs attention and is often found in the performing or communicative arts. Although they are socially active, they often struggle with close intimate relationships. Ronald Reagan was born here as was Sean Connery. Grass is a day-sign of usefulness, compromise and healing. Persons born under it are easy-going, but they are also very touchy and hide deep hurts and feelings. They are slow to get going, but once they do they don't stop. Friedrich Nietzche and Hugh Hefner were born under it. Powerful Reed, the fourth sign of the east, begins the next set of four day-signs and is associated with knowledge, strong opinions and forcefulness. Persons born under it are usually popular, accomplished and competent, having deep knowledge of human nature. They can be intellectually rigid and prone to argue, however. Franklin D. Roosevelt was born under it as were Carl Jung and Sigmund Freud. Ocelot, the day-sign of Edgar Cayce and Paul Newman, comes next and rules psychic abilities and counseling. It produces persons who are secretive and private but make good healers and consultants as they are not afraid of getting involved with other people's lives. They are often deeply moved by spiritual or religious matters. Eagle comes next and it is a day-sign associated with vision and attention to detail. Persons born under it are usually independent, perfectionists, and technically minded. They can be very ambitious and critical, yet they also enjoy a good escape now and then. This is an open-minded day-sign, the sign of J. F. Kennedy and Cary Grant. Vulture is a day-sign of authority and hierarchy. Those born under it are status-conscious and driven to high positions, or they become the victims of those already so positioned. They are serious people who learn to face life realistically. They are often hardened to life and difficult to reach emotionally. Ayn Rand and William F. Buckley III were born under it. The last set of four day-signs begins with another sign of the east, Earthquake. This is the day-sign of forceful intellectual activity and progressive thinking. Persons born under it are often controversial because they believe strongly in ideals are work to implement a new order. This is the day-sign of Benjamin Franklin and Alfred Hitchcock. Knife is a day-sign of both self-sacrifice and self-interest. As a result, persons born under this sign frequently struggle in close relationships. They are also practical and mechanically inclined, compromising, very social and sometimes vain. Examples are Peter Sellers and Jackie Onassis. Rain is a sign of mind, compassion and healing. Its natives are youthful, restless, mentally active and friendly. They are usually multi-accomplished, though the counseling and healing professions are where they are at their best. These persons are concerned with purification and cleansing. Pete Seeger and Sandra Day O'Connor were born under it. Flower, symbol of beauty, perfection and the ideal, is the last of the twenty day-signs. These persons are persistent dreamers, socially awkward, but always well-intentioned. They are devoted friends and lovers, but often suffer in relationships because of unrealistic expectations. Albert Einstein and Vincent Van Gogh were both born under Flower. An understanding of these signs, similar to an understanding of the zodiac, is the key to Mesoamerican astrology. Here is a system in the process of rehabilitation that offers an extraordinary personality matrix, one that in most cases requires no birth time. Within this system is a most accessible means of self-knowledge with tremendous potential. The day-signs, the core of Mesoamerican astrology, are one of the greatest intellectual achievements of New World civilization, and it lives again in the 21st century. Determining the day-sign and 13-day sign (only two of the elements in a full Mesoamerican horoscope, though probably the most important ones) have in the past required tables that are far too long for this short article. With computer software, however, calculations are instantaneous. An easy way to find your day sign and your place in other important cycles used in Mayan astrology is to get your Mayan Life Path Astrology report, available from Alabe.com. Bruce Scofield is the author of Astrolabe’s Mayan Life Path Astrology and Professional Forecaster reports, as well as a number of books including Day-Signs: Native American Astrology from Ancient Mexico, Signs of Time: An Introduction to Mesoamerican Astrology and How to Practice Mayan Astrology. His website is www.onereed.com.